Using Zoho as your CRM and have LiveChat implemented on your page? Then set up this integration to automatically add chat visitors as leads in Zoho. Follow the instructions below to create a Zap adding a LiveChat contact as a lead in Zoho CRM. You can use a ready-made Zap template to set up this integration. Check it out in LiveChat Zapbook. The first step to set up this integration is to determine a condition that will trigger an action in your target app. Log in to Zapier and click on Make a Zap in the upper menu. Choose LiveChat as the Trigger App. Select Finished Chat as the Trigger. Click on Save + Continue to proceed. Click on Connect a New Account and then provide your LiveChat login email and the API key. Next, click on Yes, continue to accept. You can rename the account and then click on Save + Continue. Select Fetch & Continue to test this step and make sure it is working properly. High time to configure what will happen in your target app after the chat is finished. Choose Zoho CRM as Action App. Then choose Create/Update Lead as the action and confirm by clicking on Continue. Grant Zapier the access to your Zoho by providing Auth Token in the pop-up window and clicking the orange button. 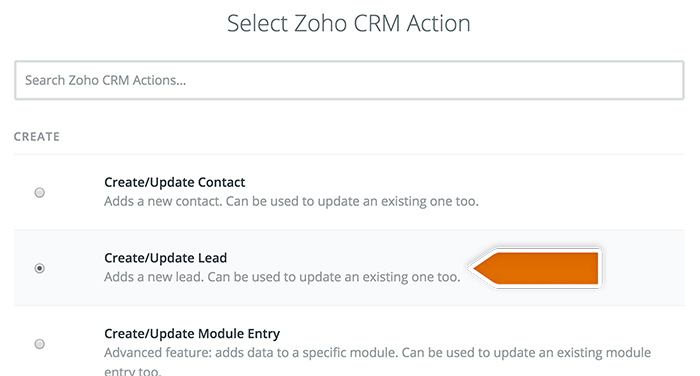 Select your Zoho CRM account and confirm the choice by clicking on Save + Continue. Next, decide which data will be passed to Zoho. After you finish, click on Continue button down the page to proceed. Ready to go live? Let’s turn this integration on then. 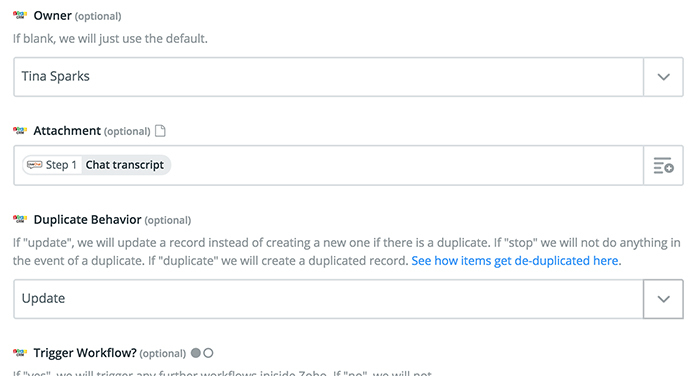 Zapier will ask you to test new Zap. Follow the instructions to make sure your Zap is working correctly. Next click on the Finish button. Turn the Zap on by clicking on the grey switch and start passing information from LiveChat to Zoho. Congratulations! You have just linked your LiveChat with Zoho through Zapier. At the end of each chat, it will pass new LiveChat contact as a lead to Zoho CRM. 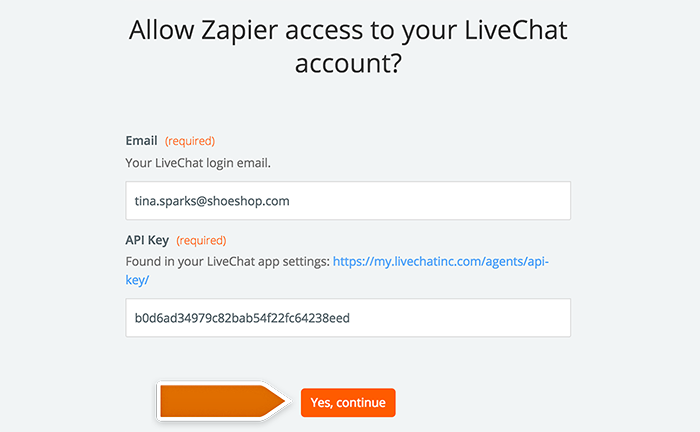 Auth0: boost your LiveChat’s security with Single Sign-On!